The Fox River Navigational System Authority has closed the Menasha Lock going into the Labor Day weekend due to discovery of an invasive species of fish into the important Wisconsin waterway. Working with anglers fishing the Lower Fox River, the Wisconsin Department of Natural Resources has confirmed the presence of the Round Goby - an unwanted aquatic invasive species -- immediately below the Neenah dam. In a media release on September 3, 2015, Kendall Kamke, DNR Oshkosh fisheries team supervisor, said the four gobies caught in recent days are the first evidence of the species in the waterway above the series of locks and dams downstream. The DNR is asking area anglers for additional help to determine if the species is also present upstream of the Neenah and Menasha dams in Lake Winnebago and is coordinating efforts with the Fox River Navigational System Authority. "We also would like to learn whether the gobies are present in other locations," Kamke said. Since its discovery in the St. Clair River in 1990, bottom-dwelling round gobies have spread rapidly into many areas of the Great Lakes including Lake Michigan. Round gobies can survive even in poor quality water and displace native fish by eating their eggs and young, taking over optimal habitat and spawning multiple times per season, which gives them a competitive advantage. 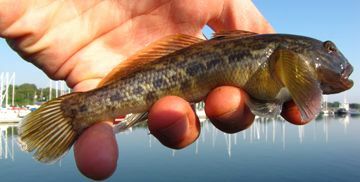 "The gobies represent a real threat to the valuable native species in the Lake Winnebago system - home to a world class walleye fishery, the largest self-sustaining population of lake sturgeon in North America, good populations of bass, yellow perch and other game and panfish species," Kamke said. "We are grateful to the Fox River Navigational System Authority for the partnership involved in this effort." In addition, Kamke said, DNR is asking for assistance from anglers to help determine whether the gobies have made it above the Neenah and Menasha dams and are in Lake Winnebago or whether they may still be held in check downstream. The DNR would like caught gobies to be brought into the DNR office with details of the catch. The DNR is not sure how the gobies made their way into the Lower Fox. The system of locks has not been operational for many years, with the Kaukauna locks closed for rebuilding while the Rapide Croche Lock was permanently sealed in 1988 to prevent invasive species from going upstream into Lake Winnebago. Kamke said there is no way to determine how the gobies arrived in the channel below the Neenah dam, which opens into Little Lake Butte des Morts. In addition to working with local anglers, DNR fisheries and aquatic invasive species team members will continue to set traps and use shocking equipment to determine the range and extent of the population.